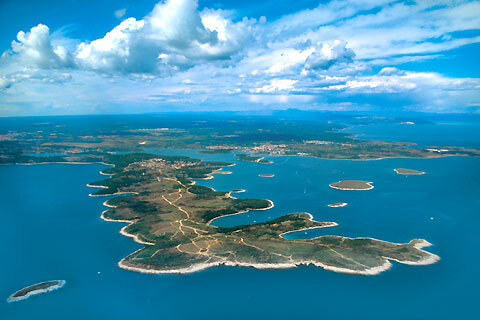 Kamenjak is a protected natural area situated at the very tip of Istrian peninsula and it is often described as “a wonder of Nature’s architecture”. It has a 30km long coast with many beaches, bays, coves and more than 550 plant species. 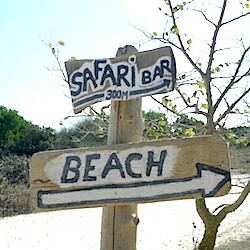 At the most southern promontory there is famous and popular Safari bar whose particularity is that it is entirely built from the materials found in the immediate surroundings. If you enter Kamenjak nature park with car or motocycle an entrance ticket must be purchased, otherwise the entry is free. From Ližnjan take a road to Medulin, proceed towards Pula, then after few kilometers turn left to Pomer, proceed towards Banjole and finally turn left to Premantura. From Ližnjan to Premantura is about 13km. Some pictures of Kamenjak are here, and this are some external links about Kamenjak.